my company was bought by another company almost 2 years ago – as a result, many changes, some of which are causing even long term employees to leave, including benefits, management, small or no raises, etc. People were leaving some thee years ago but recently we have experienced a number coming back. We have an older workforce and many of our employees are starting to retire. Our young employees seem to get antsy and want to move up and on to bigger things as fast as they can. We are a local government and can’t compete with some private industries, especially in the labor market. chaotic paradigms and management by crises make people nervous and stressed out on a daily basis. no horizontal communication. staff is not respected on any level. Further, employees tend to leave the organisation because of limited career advancement opportunities, lack of appreciation and recognition as well. High attrition in group of group of new joinees due to their expectations was not met in short time. The President of the company I currently work for is out of touch with employees . She currently lowers people hours to make them quit if she thinks they make too much money. County government can’t pay what private business is paying. Opportunity and management tend not to interact with the retirement variable. Some use entry as a training ground, then depart (within the avg. 3 years). Generally speaking, the most satisfied are the least skilled and competitive. Also have quite a bit of job abandonment or no call no shows. Very frustrating. Organization in fiscal distress with strong go-forward strategy and the instability is more concerning to some employees than others. Though who cannot tolerate it – choose to leave. More people are seeking jobs that allow for greater flexibility or less expectations of taking work home or being always accessible. Feeling of satisfaction on their job, that they are contributing. We have issues with people not following directions, not wanting to work and calling out sick from 2 or more days per month. 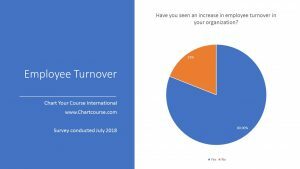 Most of our turnover is associated with the turnover of part-time staff due to obtaining better jobs or pay rate with other organizations. Not currently an issue for us. teachers are making more money with the public school system, we are a non profit organization that don’t reward our teachers for obtaining degrees. We are non-profit and lose staff to similar organizations for pennies. Also for promotions. We are working on career pathing and succession plans to address the latter. 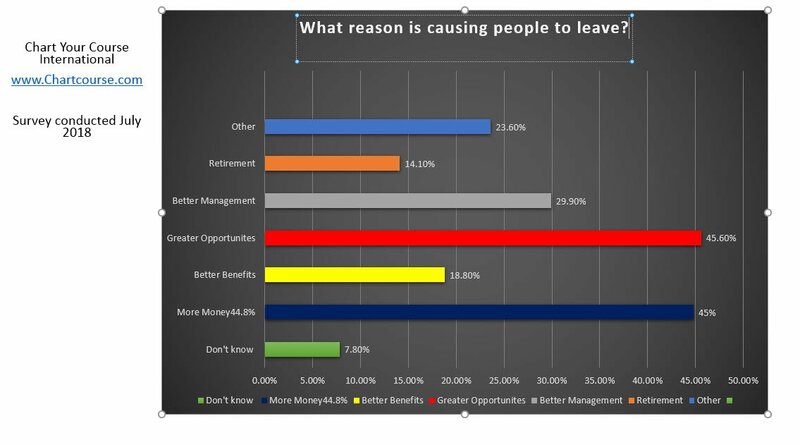 It is obviously that most of the employees leaving the company is always looking for a greener pasture. It seems that millennial are most doing the shift. Our smaller organization has stable membership. Nurses would want to be less accountable, but more take home and benefits in cash. Facilities which are earned annually – does not benefit them. They look for short term gain. Company is grown at a fast pace and find that with a lot of management promotions there are some of them forgetting where they come from and do show respect to players.